The vineyard house is a house for the discerning connoisseur who seeks rural life in the luxury of simplicity. We chose oiled solid wood oak. With lots of glass, we tried to bring nature into the living room and rich fabrics to create coziness and harmony. Stylish crockery and glass and accessories round out the ambience. A well-kept garden invites you to make it to the lying or hanging chair comfortably and enjoy the panoramic view. Impressive is the large terrace with the surrounding larch handmade stone wall. Our vineyard houses are located on the ridge of the Grassnitzberg in the nature park "Südsteirisches Weinland". The unique, quiet location, intoxicating views of the vineyards conjure an incomparable atmosphere. Enjoy the house on its own, its exceptional facilities, the solid wood for flooring, windows, doors and furniture, style elements of the area in minimalism. A glass of wine under the arbor, the fire in the fireplace, the deck chair in the garden, cooking as a passion, the wine roads, hiking and biking trails from the front door, my hosts pleasure, the orchard in the vineyard, river pools and lakes, trails and ski slopes, Fishing, tennis courts and horse farms, a 4star * spa area in the immediate vicinity, close to spas, walk attainable taverns and wineries, the small wine, Marburg, Graz, wine tasting, festivals and cuisine at the highest level guarantee variety throughout the year! Do you want the same jausnen when you arrive? Let the refrigerator with typical regional farm products filling (breakfast or Jausenkörberl). The daily passing by the baker brings you fresh pastries, dairy products and sweets in the house - hanging the Körberl before the door just on the eve. Shops can be found in the vicinity. Quaint, typical wine taverns and wineries, as well as a good pub within walking distance. 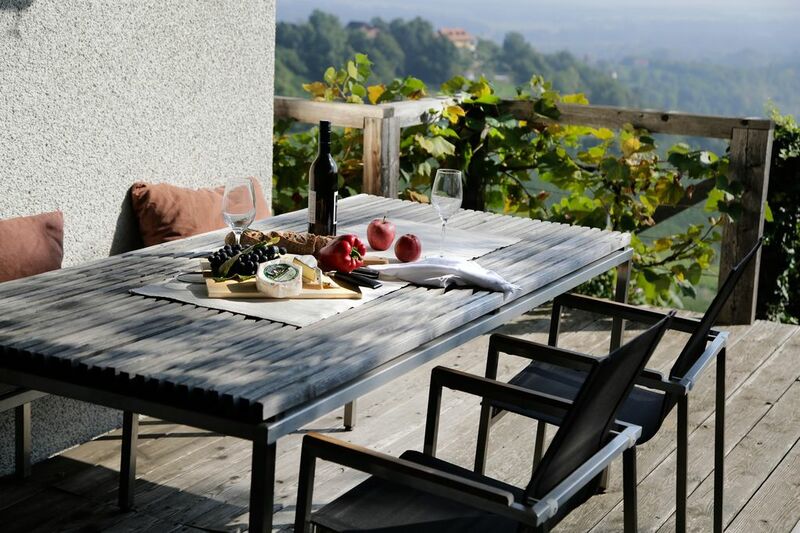 Along the South Styrian Wine Road, there is a dense network of Wine inns, taverns, wineries and gourmet restaurants. Perfektes Ferienhaus, super Lage, sensationelle Aussicht, Wanderungen durch die Weingärten, ausgezeichnete Weine - und dazu noch eine Woche traumhaftes Wetter. Ja, das war Urlaub! Das Haus ist einfach das perfekte Ferienhaus. Alles ist neu und hochwertig und gut gepflegt. Wir haben und vom ersten Moment an wohl gefühlt. Der Empfang war sehr freundlich und die Restauranttipps gut und hilfreich. Es sind einige Einkehrmöglichkeiten gut zu Fuss erreichbar (auch mit Kind). Die Aussicht ist einfach ein Traum, auch wenn wir sie aufgrund des eher schlechten Wetters seltener richtig genießen konnten, aber bei warmen Wetter ist die Terrasse sicher wunderschön. Wir haben es uns eben in der gemütlichen Wohnküche mit Kachelofen oder im Wohnzimmer bequem gemacht. Die Betten sind wirklich gut, da haben wir schon ganz anderes erlebt. Das einzige was für "Dunkelschläfer" etwas problematisch sein könnte, sind fehlende Verdunklungsmöglichkeiten, die vorhandenen Vorhänge machen nicht wirklich dunkel. Es war alles wie beschrieben und die Bilder sind realistisch. Sehr nette und unkomplizierte Vermieterin. Wunderschönes Haus mit toller Fernsicht. Sehr gute Erreichbarkeit von der Autobahn, trotzdem ruhig gelegen. Mehrere hervorragende Ausgehmöglichkeiten in wenigen Minuten zu Fuß erreichbar. Die Wohnung ist hochwertig, die Betten tipp-topp. Es blieben keine Wünsche offen. sehr schöne Lage , sehr gut und hochwertig möbliert (schwere Echtholzmöbel) und ausgestattet. The Grassnitzberg is a special vineyard in the Nature Park South Styrian Wine Country. It prides itself on its top wineries, especially Tement and Polz, produce international wines. Scenic it is especially appealing widely to the views in the Steiermark inside. Vines, -laub and grapes in the hilly to steep vineyards determine the nature. Meadows, forests, mountains and meadows surround this backdrop. Cosy taverns delight with homemade delicacies and fine wines. Enjoyment and culinary delights at the highest level - let us surprise you! Our Natural Park allows us and our guests of all ages and every season an enviable quality of life: moving from farm to farm on the wine trails to Kungota-Aussichtswarte, cycling, horse riding, jogging, biking or walking level or hilly in the magic of the scenery, wine festivals with brass music, tastings, museums and concerts or gourmet cuisine, Schofkaas, wild garlic and cook yourself looking. The wine road (about Ehrenhausen, Gamlitz, Leutschach, gloss, Eichberg-Trautenburg, Arnfels and Oberhaag after Kitzeck) there is a dense network of Wine inns, taverns, wineries and gourmet restaurants. Some of them are from our houses within walking distance! In a few minutes you can reach by car, the unique new 4 * + Hotel LOISIUM Wine in Ehrenhausen with a beautiful spa area.